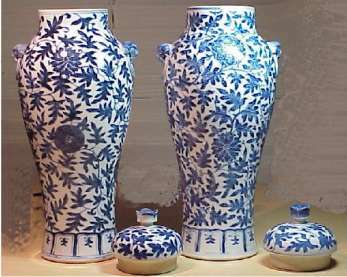 Are these blue and white lidded vases Kangxi? 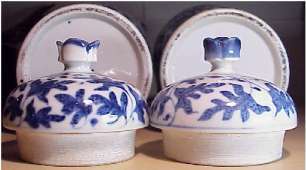 I have attached pictures of a pair of lidded jars that I own, they appear not being made by the same person which I determined by the color intensity of the blue as well as the difference in the signature's. They were originally sold to me as a pair of blue and white lidded jars bearing the mark of Kang Hsi 1662-1722 and they stand 34cm tall, the big question is, what are they? Interestingly enough your vases have the mark of "Guangxu nian zhi" which is referring to the Qing dynasty, Guangxu (1875-1908) period. When the mark matches the period from which they are made this might sometimes mean that they could be of Imperial make. In this case I am reluctant to think so since they are nice but more of Trade quality then "Imperial". As a pretty surefire sign, we see that the two first characters in an Imperial mark, the Da Qing referring to the "Great Qing dynasty" in the mark, has been omitted. Their shape and the domed lids with their unusual finals would to me indicate a slightly later date than that even though many would accept them as being exactly of the period of the mark. I can't tell for sure, but personally I think these vases are of the period of the mark. This is in that case called mark and period, or in short M+P in the auction catalogs. This is interesting for collectors and it helps with the price. However not of the Kangxi period they are quite nice anyway.